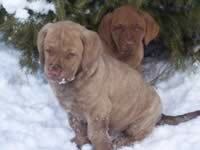 We have a litter of Chesapeake Bay Retriever Puppies born on December 28, 2010. Sire and Dam CH Chestnut Hills Bruin (SR19740602)X Spendthrift's Amazing Grace ( SR06756806). Both parents have been checked for Degenerative Myelopathy, have OFA and Cerf certification. 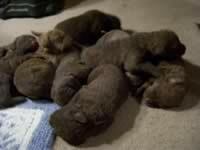 The litter includes 4 males & 4 females. 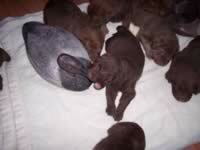 Pups will be of age to leave their mother at 7 weeks of age (approximately February 21, 2011). For further information call 315 594-2117 or email at djmc@rochester.rr.com.